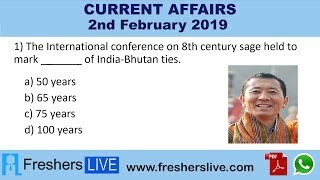 Current Affairs 2nd February 2019: Instantly obtain Latest Current Affairs 2nd February 2019 with all essential info, Be the first to know all the Current affairs 2nd February 2019 top news, Major Issues, Current happenings, Important events in National as well as International level with clear explanation. For all competitive exams and Interviews, equip yourself with the Latest Current Affairs 2nd February 2019 granted here. The Centre has allocated Rs.500 crore for a new pension scheme for workers in the unorganized sector, even while reducing its allocation for an existing pension scheme by Rs.775 crore. The new scheme, to be called the Pradhan Mantri Shram-Yogi Maandhan, will benefit unorganized sector workers who have a monthly income up to Rs.15,000. It will provide them a monthly pension of Rs.3,000 from the age of 60. The Centre expects 10 crore workers to get the benefit within the next five years. Gupteshwar Pandey, the Senior IPS officer, took over as the new Director General of Police of Bihar. He succeeds K.S.Dwivedi. Mr.Dwivedi has been holding the position since March 1, 2018. Mr.Pandey has been known for his hands-on style of policing and attempts at making the civil society an active participant in law enforcement. Department of Industrial Policy and Promotion (DIPP) renamed as the Department for Promotion of Industry and Internal Trade with a mandate to deal with matters related to start-ups, facilitating ease of doing business among others. The newly-named department under the Ministry of Commerce and Industry will look into matters related to promotion of internal trade, including retail trade, the welfare of traders and their employees, facilitating ease of doing business and start-ups.